* 18 pockets to grow a variety of plants. * Perfect for creating a bright feature wall or vertical herb garden. * Create striking living art pieces, beautification household and freshness air. * Fantastic way to brighten your indoor or outdoor walls and fences with greenery, flowers, herbs and vegetables. 1.Simply hang on it on the wall. * MATERIAL:Adopt the non-woven fabrics, durable, long term use. provides easy vertical garden solution. * IDEA DESIGN:Lightweight and simple to hang up,designed with felt material which retain water and release slowly for the perfect soil conditions. 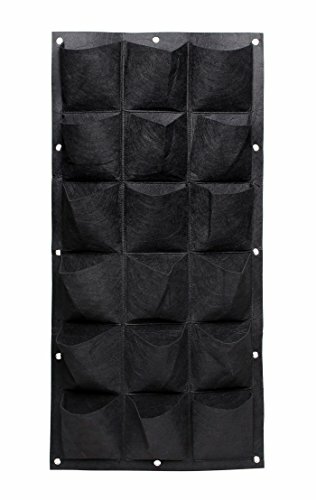 * EASY TO INSTALL:The metal eyelets/grommets make hanging more quick and easy. * SUIT FOR:Indoors or outdoors to grow various of herbs and flowers. * BEST GIFT: A great gift for gardeners both aspiring and experienced. a quick and easy way to start gardening anywhere.save your space,make your garden life more interesting.